Everyone morning before I go out the door, I always ask God to show me His awesome wonders. This morning it was really foggy and I thought, “God is there something in this fog I’m to see”? After I dropped my kids at school and I was pulling in front of our home, I had this urge to look up. When I looked up, I saw the house across the street from us. I looked at the roof and on their satellite dish was something, but I could not tell what it was in the fog. I walked over to the house and looked up. There was the most beautiful eagle perched right on top of the dish!!!! It almost looked like a statue. I looked at it to make sure it was really a live eagle and the most spectacular thing happened. The eagle looked down at me. I just began to praise God for this beautiful moment. Me and an eagle looking directly at each other. I did not want to leave, but I had to. As I was leaving, I turned back around, looked up and the eagle was gone!!! As I was walking back, I thought about Isaiah 40:31, “But those who wait on the Lord Shall renew their strength; They shall mount up with wings like eagles, They shall run and not be weary, They shall walk and not faint”. (NKJV) I like the Message translation which says, “But those who wait upon God get fresh strength. They spread their wings and soar like eagles, They run and don’t get tired, they walk and don’t lag behind”. When we are running the race of faith, there are times when we get weary. So weary that we want to give up and stop running. But God, who is our STRENGTH tells us in this verse to keep on running the race. Even though you are tired, I will give you fresh strength. I will help you finish the race! 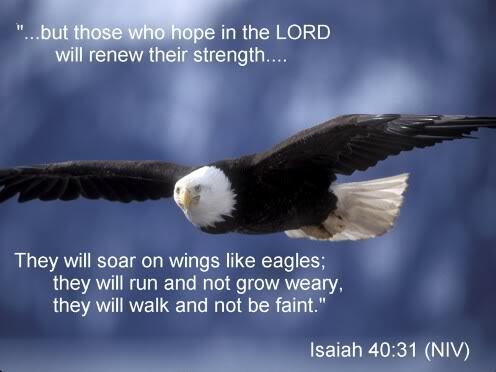 When God gives you strength to keep pressing on, you feel like you are soaring like an eagle! You are ready to continue the great race of faith. When you feel tired and worn out from life and the many battles you go through. Remember Isaiah 40:31. Read it out loud. Post it on your mirror, your refrigerator, or even put it in your cell phone. When you get tired and feel as if you can not go on, read the verse out loud. Ask the Lord to give you fresh strength to continue on. He will! Then my brothers and sister in Christ, SOAR LIKE AN EAGLE!!!!!!! This entry was posted in encouragement, life and tagged faith, God. Bookmark the permalink. What a beautiful blessing for God to send the eagle to inspire you to write this post! It’s just what I needed today when I’m feeling so tired and worn out. 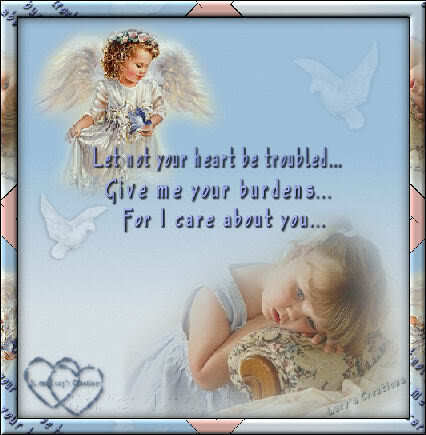 Blessings to you, my sweet friend! Thank you so much Connie for your visit! You are always a blessing and a joy in my life. Hello Valerie, thanks for stopping by my blog and liking “A Life of Service.” It’s nice to meet you. I read through your posts and they’re all edifying but felt I should comment here. Psalm 40 give us hope and strength that God is with us no matter what. Thanks for following me. I’m following you now. I’m still new at this blog but ne of these days, I’ll get my blogroll up so watch for your name. 8 kids yes God does give us hope and strength no matter what. You are so right. Thanks for visiting. I love making new Christian friends! Blessings! Nin thank you so much for your comment and for visiting. God is truly amazing. Blessings to you. Nin Amen! I do not know how I would make it without God’s strength, grace and mercy. I owe all to Him. God bless and thank you so much! Really like this post. God is so good and kind! Seeing the eagle was a blessing to you, and you are a blessing to us who read your posts. triciajots, what a blessing your comment was. Thank you so much. God is truly great!